Dr. Tom van Eijk: This is Laura, Laura is my model, and she is 20 years of age. Three years ago she had a treatment in ireland and she told me she didn’t really like the results. She described the result as making her lips broad and unnatural. Discussing the end results, she indicated that she would like to have an elevation of the outer third. When she opens her mouth you can see a slight deviation of the midline, dental wise. When people ask me to try and correct an asymmetry like that we almost need to disappoint them because that’s to do with the bones, and it’s very difficult to compensate on the lip level for something that is crooked underneath. It’s ok though, you know, we’re all asymmetrical! Dr. Tapan Patel: I think that’s a good point, Tom, that when we look at the asymmetry it’s so important to understand what’s causing it; the dentition, muscular imbalance, scarring, etc., and I think people just see the asymmetry. Obviously you’ve determined that in her case the asymmetry is due to a dental issue so it’s going to be difficult to correct it. Dr. Tom van Eijk: You can also see that the left part of the upper lip appears to be a little bit more bulky in comparison to the right side. 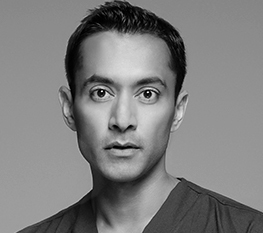 Dr. Tapan Patel: Would you also agree that the overall level of asymmetry is not huge? It’s quite a mild asymmetry. Dr. Tom van Eijk: Just to make her comfortable, and for education purposes, I would like to demonstrate the Amsterdam block in her case, giving sort of a dental block in order to fully numb the lips and ensuring less swelling tomorrow morning, and less haemotoma, I think she will prefer that. Dr. Tom van Eijk: What I do is a block that resembles a dental block but is much closer to the lip itself in order to have the beneficial effect of the adrenaline, which is in this mixture. This is 2% Lidocaine with adrenaline. I inject very superficially and very slowly. As we said earlier, it’s not a race, and the slower we do this the more comfortable it will be. Dr. Tijion Esho: How much are you putting in each injection? Dr. Tom van Eijk: I have 12 injections and 3 ml of product, so 0.25 ml in each. Dr. Tapan Patel: So just to reiterate, this is 2% Xylocaine, which is a mixture of Lignocaine, or Lidocaine, and adrenaline. You’ve got a 3 ml syringe there and a 30 gauge needle, and essentially you’re just everting the lip and targeting the lower mucosa, so presumably this is just the inferior fibres of the infraorbital and mental nerves. Dr. Tijion Esho: This is kind of what we were discussing earlier about a mucosal-style block. When you use this, as opposed to a true dental block, do you see any major differences? Dr. Tom van Eijk: The difference is that this block will work immediately, you don’t need to wait for it so there are no surprises. I did a dental block to begin with and I was disappointed when people still had feeling in the middle or the corners of the mouth, and there was still too much sensitivity. To anticipate that, now we have made the first circle, we go to blister number one and inject to the side. Dr. Tapan Patel: You used an interesting term to describe this earlier, what was it? Dr. Tom van Eijk: A daisy chain. There’s logic in using your old injections to reintroduce the needle and give some more anaesthesia. Dr. Tapan Patel: What I’m noticing, both with the patient Esho treated and now yours, that she is very comfortable. Dr. Tom van Eijk: She can’t feel this, and if she can feel the Xylocaine itself then it means I am too fast. Dr. Tijion Esho: I think that touches upon what you said earlier, how comfortable the patient is sometimes depends on how slow and deliberate you are with your injections. Dr. Tom van Eijk: Absolutely, and if you do a good job here then she won’t feel a thing, it’s all about speed. Dr. Tijion Esho: Just one question with this, because obviously I’ve noticed you’re doing the raised blebs, do you find that that can give an artificial result with the volume added to the lip for the patient? Dr. Tom van Eijk: Absolutely, so you have to take into account any asymmetric starting points. This is an artefact, a 3 ml artefact put upon your shape, so I try to do this as delicately and symmetrically as possible, and as neatly as possible, so at least it won’t change. You know the philtrum is the most sensitive so the specific order of making the daisy chain and beginning at the top lip and ending at the top philtrum gives you the highest chance of her being comfortable. Dr. Tapan Patel: I have to say, and I’m not just saying this because we’re friends, but that’s probably the best example of a local anaesthetic injection I’ve seen where the patient didn’t flinch at all. Dr. Tijion Esho: Yeah, I have to say she looked completely comfortable throughout. Dr. Tom van Eijk: How did that feel? Patient: It was fine, I could feel it but there was no pain. Dr. Tapan Patel: That’s what we want! Dr. Tom van Eijk: If you want to be really really delicate, what you can do is now take your needle and examine the sensitivity just to make sure she’s okay and I do this with patients that are anxious because you don’t want any surprises. Dr. Tapan Patel: Are you going to go straight to injection? Dr. Tom van Eijk: Yes. Dr. Tapan Patel: What can I open up for you? Dr. Tom van Eijk: Normal Restylane please. Dr. Tapan Patel: So just while we’re doing this, Tom, can you talk us through your choice, why you are using this product, and what properties that it has that you feel are benefits. Dr. Tom van Eijk: In terms of mechanical properties, the Restylane is one of the most granulated, strong hyaluronic acids on the market, and it’s the oldest on the market. This is a normal syringe, one of the new ones with a special tamper-proof cap. Very strategically, they place the lot number on top of the plunger, so if you are working without taking the lot number off you cannot see the plunger, so I think that’s very smart. So you prime the needle, and as you can see this is quite a strong gel. Dr. Tijion Esho: What size needle does that come with? Dr. Tom van Eijk: It’s a thin wall needle, so it’s quite strange, but the outer diameter is 31 and the inner diameter is 29, which is a bit of a paradox, but the inner diameter fits a bigger needle than the outer diameter would indicate. So, to make a distinction between the vermillion border and the white roll is important in this technique, because the vermillion border is kind of a weak substance, whereas the white roll has a lot of collagen, so if you want to give strength you have to place your hyaluronic acid in strong material. There you go to the centre of the lip to give some volume and pull it out gently to give it a bit of strength on top. Dr. Tijion Esho: Again, you are quite superficial there. Dr. Tapan Patel: I think that would clearly be the key to safety with this technique, with both of your techniques you are very superficial, we know that the arteries do lie deep in this anatomical area, so I think with this type of technique you have to be, as you both are, in that very superficial plane, either just under the dermis of the white roll or under the mucosa of the red. Dr. Tijion Esho: I think we talked earlier about the depth of injection affecting how long the product lasts, so again here being superficial means this patient is going to get greater longevity of the product than if it was deep. Dr. Tom van Eijk: Absolutely, and if you do a retreatment then you will find yourself retreating deeper more than superficial, because with superficial the envelope will still be good whereas the filling might be gone. For the lower lip, I like for the projection to start a little bit later, like here. You see that in normal, virgin lips, the projection of the upper lip is totally different as opposed to the projection of the lower lip, and I want to exaggerate that a little bit. Dr. Tijion Esho: I think, actually, that’s exactly the approach, and you’ve shown there that you don’t have to treat the whole line of that bottom lip, and you’re accentuating the feature more. Dr. Tom van Eijk: Exactly. Notice that I’m not wiping off that blood, one of the benefits I’ve got through the white roll with the injections is that the gel itself can give a little bit of haemostasis. Dr. Tapan Patel: That’s interesting, I just noticed you doing that. Dr. Tijion Esho: Yeah, I did actually wonder why you were doing that. Dr. Tom van Eijk: I know there are people watching, but still. I am more interested in her not having bruising tomorrow than the image we have now of the blood. I think it’s irrelevant how she looks now. Dr. Tijion Esho: Exactly, like you said, even now it’s not the end point, the end point comes two weeks from now. Dr. Tom van Eijk: I know that we tend to wipe, but every time you wipe you break down the blood clotting, but that’s our friend, right? So the last injection here is on the philtrum, so the two arcs will rise, and you don’t need to treat the philtrum if the arcs are supported, the philtrum will have some extra definition just by itself. Dr. Tijion Esho: I see you’re using your thumb for the extra traction when you’re doing the injection. Dr. Tapan Patel: That’s very elegant, I mean what’s interesting to me then is we’ve seen very similar techniques, certainly by the name, the tenting technique, but by two different practitioners and two different products, both resulting in some very nice outcomes, and I think there is a takeaway message from this. Have you ever seen on Facebook forums someone saying “What is the best product for lip?” I think for a number of years a lot of experts have felt that the right practitioner can probably use a variety of products to create a result they want, it’s just understanding the characteristics of that product. They all have different personalities. Dr. Tijion Esho: I completely agree, I think there’s so many factors that come into play, and how you choose, and I always talk about the four pillars, being the patient’s anatomy, the injector’s techniques and experience, the product itself, and the desired outcome of the patient. In your case, you’ve shown all of those and come to this great outcome. Dr. Tapan Patel: Do you want me to give you something just to gently massage that Tom? Dr. Tom van Eijk: No. Dr. Tapan Patel: You don’t do that? Dr. Tom van Eijk: No, I massage when I want to replace material, so in the cheek for instance I might do one bolus and massage it out to replace it and make it a disc. In this case, my needle tip has been everywhere so I have no excuse that I have put it in one place but want it in another. Dr. Tapan Patel: Very interesting. Dr. Tom van Eijk: So I put it in one area and that’s it. Dr. Tapan Patel: So if you’re done maybe we can sit up and have a look at her and see where we’re at. Dr. Tom van Eijk: So remember this is 3 ml of Xylocaine and on top of that 1 ml of Restylane. This is not the end result, but you can still already distinguish the elevation of the canine arcs and some plumping of the lower lip. Dr. Tapan Patel: I think one of the learning points from this is that both of you using a technique that I don’t necessarily use at the moment, and what’s great about any educational forum is that when you participate you always come back with something new. So both in terms of your amsterdam block, the tenting, which I have to admit showed beautiful results, they are definitely two things that I anticipate bringing into my practice. What we will probably see with the patients I treat is how the cannula might be used in a slightly different approach, hopefully to give very similar and very nice results. Thank you very much, Tom.